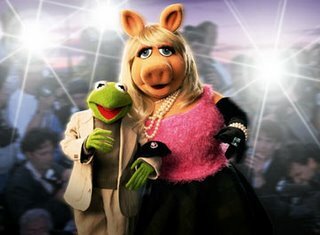 Katherine with a K: Kermit does Miss Piggie? As a child of the 70's, I have very fond memories of the Muppet show. If I remember correctly, the muppets were on Friday nights. Mom would give us a bath, stick us in fresh jammies and plunk us in front of the tv for our favorite show. But now, now THIS???? "The Jim Henson Company's renowned puppeteers demonstrate what happens when traditional comedic improvisation is mixed with the uninhibited anarchy of live puppet performance. Not your average night of improv and definitely not for children."